Although watches were first made for women rather than men in the first half of the last century, the larger casing for men’s watches made it easier to construct intricate mechanical movements, and as a result, high end men’s wrist watches have tended to dominate the market. But that is now starting to change, and one of the key trends to watch out for in 2013 is the continued emphasis from all the high-end Swiss manufactures on intricate women’s watches. As technology improves and components continue to get smaller and women’s watches become acceptably and fashionably larger, many special features such as chronographs, atomic time, solar power and sophisticated mechanical complications are able to fit into the smaller watch cases of ladies watches, and both designs and calibres are becoming increasingly creative and complex. The new Caprice Butterfly from Ulysse Nardin is a case in point. Brilliant in blues, and delectably adorned in 3.8 carats of diamonds (353 to be exact), the 18-karat white gold, and limited-edition Caprice Butterfly is simply breathtaking. 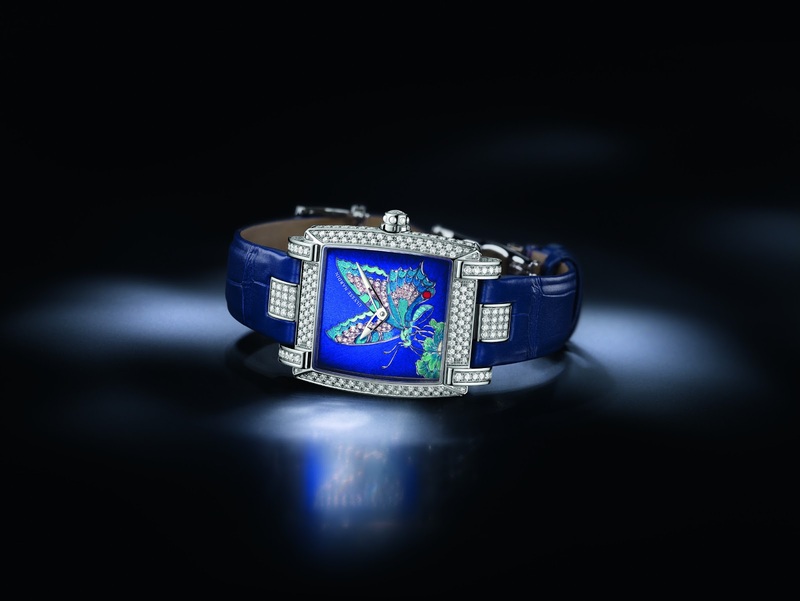 Yet, it is the butterfly, itself, produced in Enamel Champlevé that further reveals the artistic mastery of Ulysse Nardin. With this technique, superior care and precision is crucial to its success. Cavities in a thick metal surface are created, filled with moist powdered enamel and then fired. Sanding delicately by hand, excess enamel is removed, allowing the enamel’s true colour and shine to shine through. These vibrant, glistening hues are accented by strong metal borders, heightening the meticulous detail of this art form. The butterfly stands out against a brilliant blue dial. 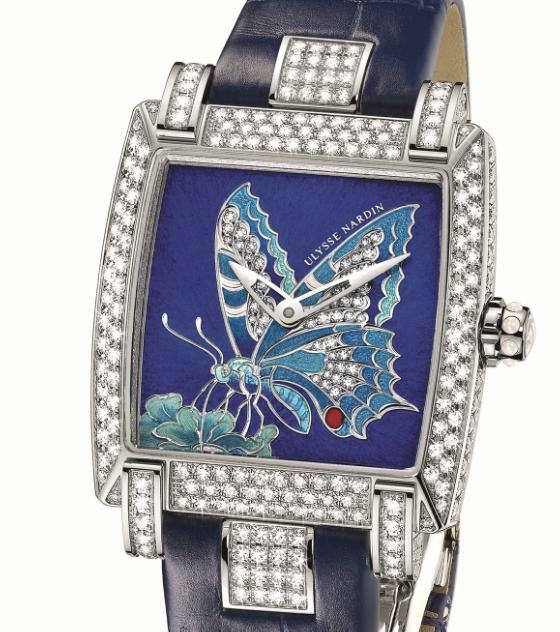 The new Caprice Butterfly timepiece is presented as a limited-edition collection of 28 pieces. The watch is powered by an in-house UN-13 self winding movement with a 42-hour power reserve. The caseback reveals the mechanism in action. The watch comes on a leather bracelet with an 18ct folding buckle 18ct white gold deployment clasp. 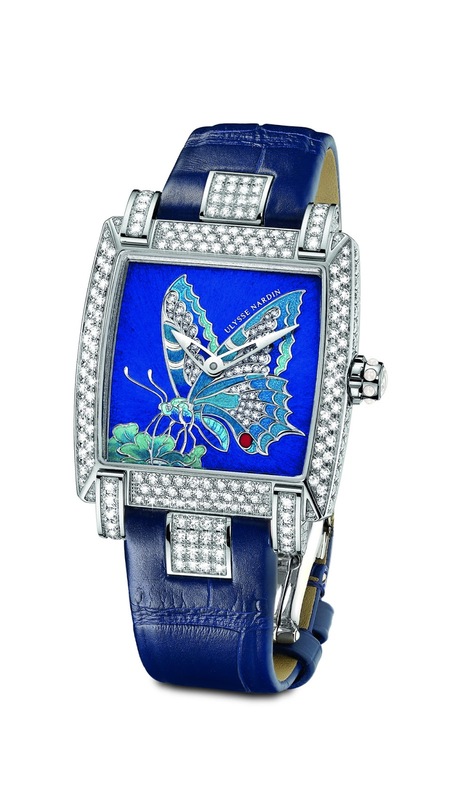 The watch is rarer than several butterflies too, as it’s limited to just 28 pieces.